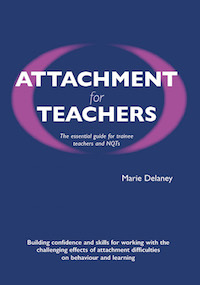 Every trainee teacher and NQT needs to know about the importance of attachment in schools. So many children and young people arrive in class every day who are unable to settle to learn. Many are coming from previous or current home environments which have not provided them with the necessary consistent security and reliable warmth for them to be relaxed, confident and trusting. Some have experienced trauma, loss, neglect and abuse. They communicate their distress through their challenging behaviour in school. What is needed first and foremost for such pupils of all ages is an authentic relationship of attachment with school staff who can get to know them, genuinely empathise and enable them to settle securely and begin to feel safe. Then, and only then, can the task of learning begin. This handbook first explains succinctly why an understanding of attachment theory is vital for all teachers. It then provides practical examples of how a teacher can recognise what the pupil's behaviour is communicating and how the teacher can then effectively intervene to enable the pupil to settle to learn and the teacher achieve freedom to teach. Marie Delaney is a teacher, teacher trainer, educational therapist and Director of the Learning Harbour in Cork, Eire. She has worked in schools as a Learning Support Unit Manager and Learning Support/LSU co-ordinator for primary and secondary schools in London. She was a trainer and moderator on the National Training for Learning Mentors. She is currently training teachers for the British Council in the UK and overseas. She also works as an Emotional Literacy Consultant. Her main interest is introducing, through workshops and practical seminars, therapeutic approaches into all schools to develop realistic strategies for challenging behaviour.